At the announcement for the release of the Vaio VPC-F11 series, Sony used the word "Gamer" for the first time in its press statement. 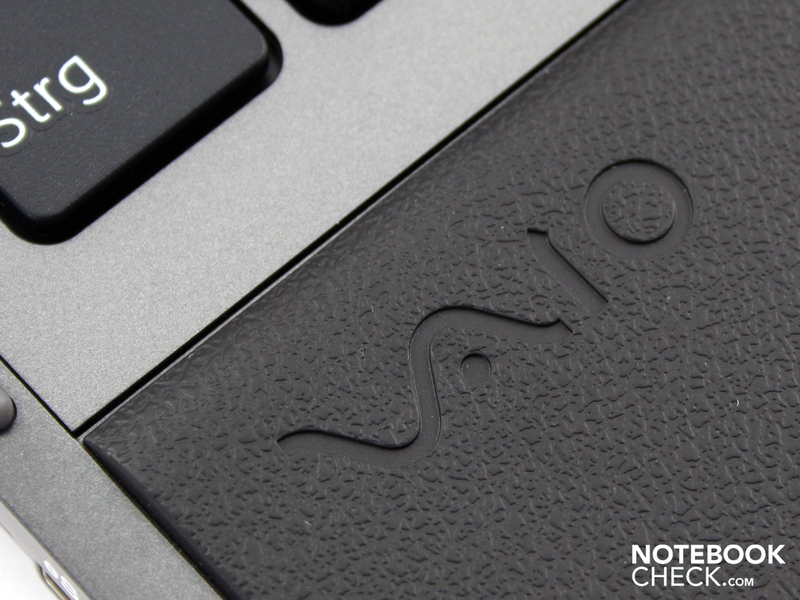 Sony fans listened attentively: Could this Vaio be suitable for gaming? The parameters allow speculation for a multimedia-master or a desktop replacement. A matte full HD display with strong colors, Core i7-720QM, 8 GB RAM, and an Nvidia Geforce GT 330M definitely have potential for high performance. Your ultimate full HD studio. 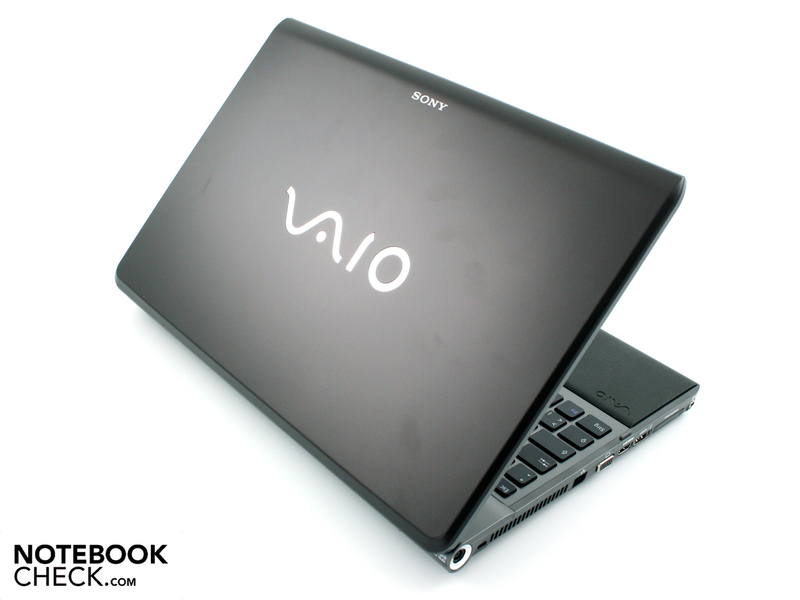 This is how Sony describes its 16.4 inch F11Y1E/BI notebook on the Vaio homepage. And indeed we have the honor of dealing with a luxury model, which should find it easy to satisfy as a high-end multimedia device thanks to its hardware. The Core i7-720QM processor, 8.192 MB of RAM, GeForce GT 330M graphics card, and Blu-ray writer (BD-R/RE) will let any tekkies heart beat faster. Real studio-feeling only comes up when mentioning the display configuration though. Sony included a matte 16.4 inch TFT display, with good viewing angles, and strong colors. Whether this can convince despite any doubts will be determined in this review. The chassis makes a solid and high quality impression. It easy to recognize its purpose as a desktop weapon by the massive build of the case at first glance. The measurements hardly allow it to fit into the rucksack, and the weight of 3.15 kilos, plus the 534 grams for the power adapter, speak against mobile use. Users can however get their joy from the high quality construction of the chassis and the lid. With both hands holding the sides, the chassis will only bend minimally when applying force. The hand rest area and the touchpad are similarly stable. An exception is the left area, which can be dented with little pressure. The surface is covered with a hard rubber, which emulates the structure of leather. Hands feel good on the dull and very wide surface. 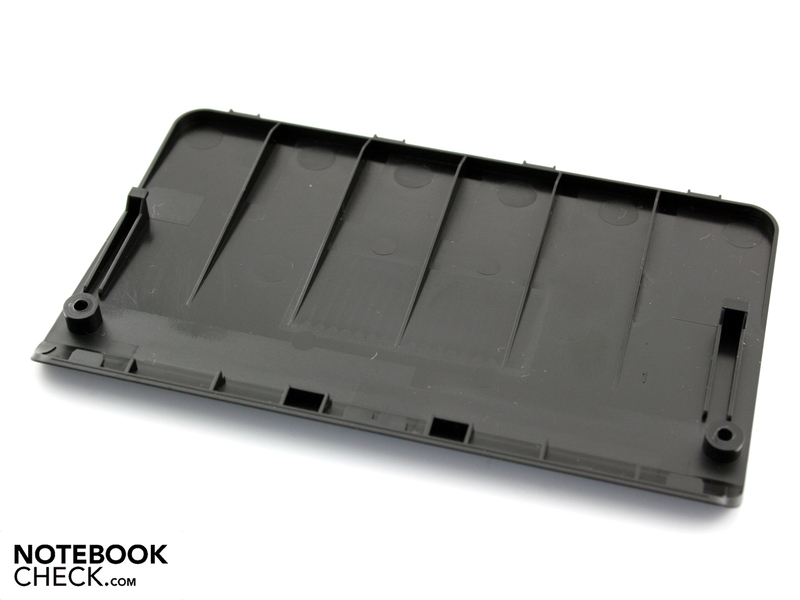 The base plate of the chassis is made of a smooth plastic. 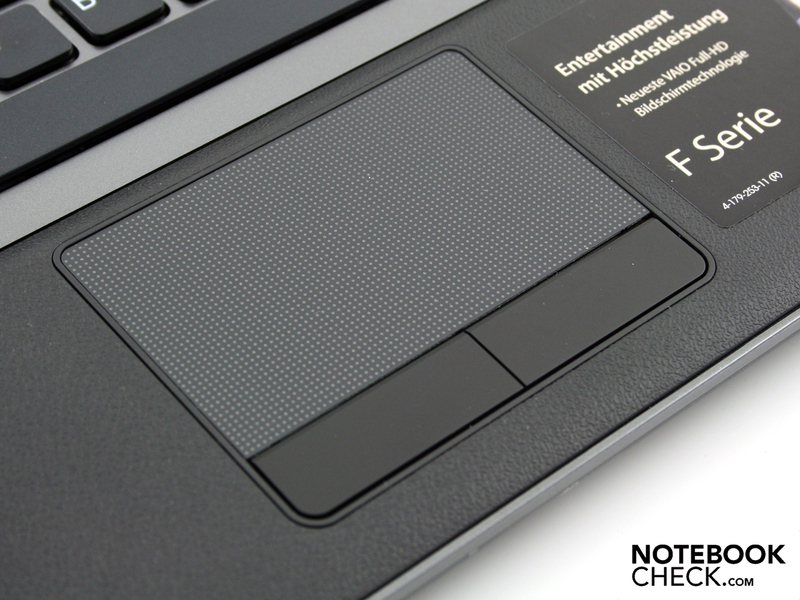 The surfaces are stable, and only at the cooling fan vents can dents be caused by a finger. There are two maintenance panels. The one at the front is for the hard drive, and the one in the middle is for the two DDR3 RAM modules. The matte surfaces of the case make a sober classical and work suited impression. The Vaio F11-model visually makes the impression of a work device for creative professions. 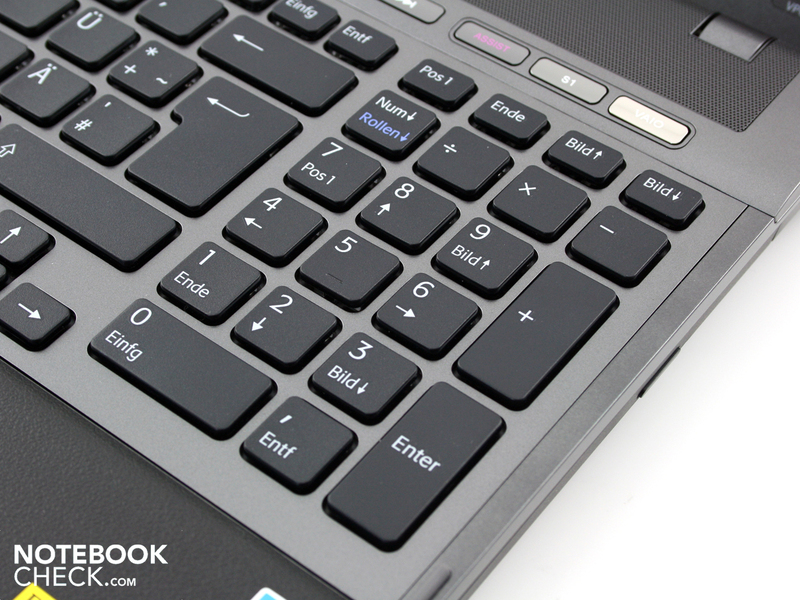 The hardware and the matte display meet the exact requirements of this target group. More on this later. The hinges hold the heavy lid securely in position, and don't tend to allow any teetering. The maximal opening angle is more than adequate for use while on your lap. 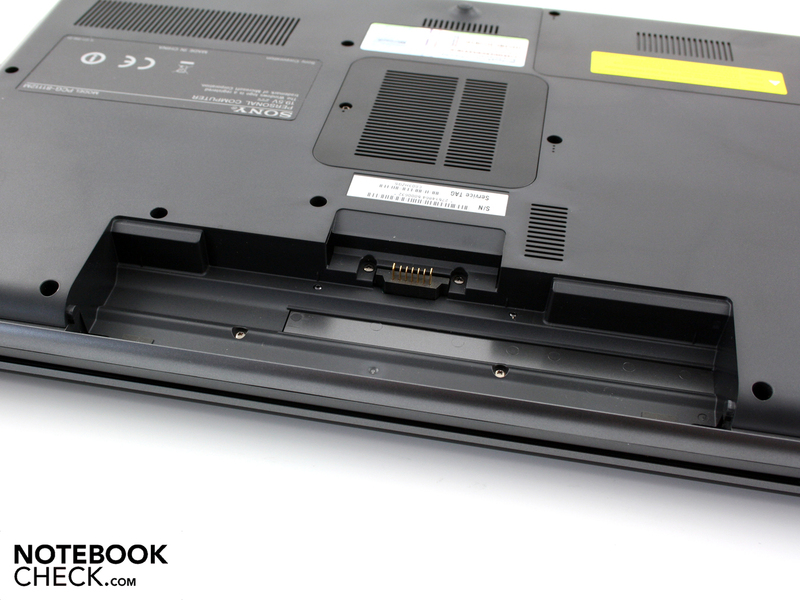 When opening the Vaio F11Z1E only one hand is necessary due to the hinges not being too stiff. Sony didn't save on interfaces and offers the complete spectrum of current connections. As well as Ethernet and VGA, there is an HDMI output. The HDMI output can be used for connecting to a television to provide audio and video. This appears useful for many games, but this port is interesting also for professional users. 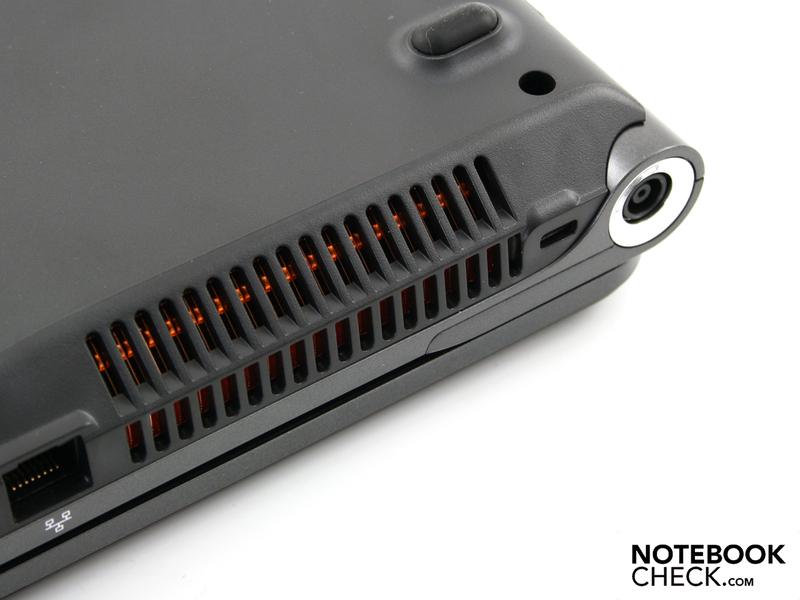 An ExpressCard34 slot is also on board. With this it is possible to connect external devices such as sound cards, storage devices, or TV cards. For professional users the FireWire and eSATA ports are particularly interesting. The iS400 port (FireWire) can for instance be used to connect camcorders or external hard drives. The eSATA port, combined with a USB port on the F11, provides fast data transfers with external eSATA hard drives. This port is particularly important for all those that work with large pictures or videos. 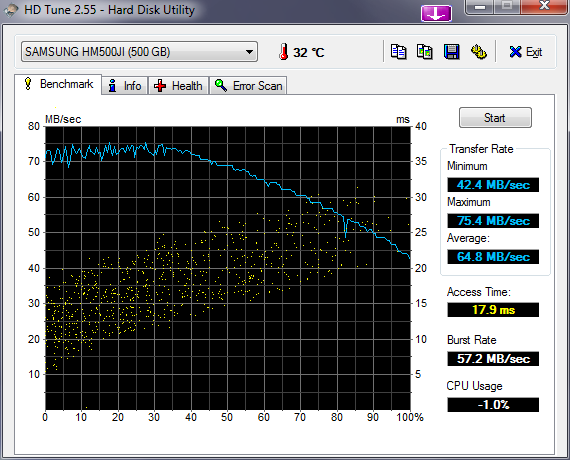 The data transfer rate is as fast as if the HDD was integrated into the notebook. Most of the interfaces are located on the left side. For right handed people this will immediately prove itself to be practical, even though there are also interfaces on the right side. Located where they are, USB or audio cables could obstruct an external mouse. Someone who pictures the Vaio F11 with all the ports occupied with a complete set of cables, will recognize the disadvantage of having all the interfaces located on the sides. In no time at all the desktop is covered in messy cables. Interfaces at the back of the notebook would likely have been much more practical for users. The attachment of the display unfortunately completely prevents any ports from being located on the rear side. 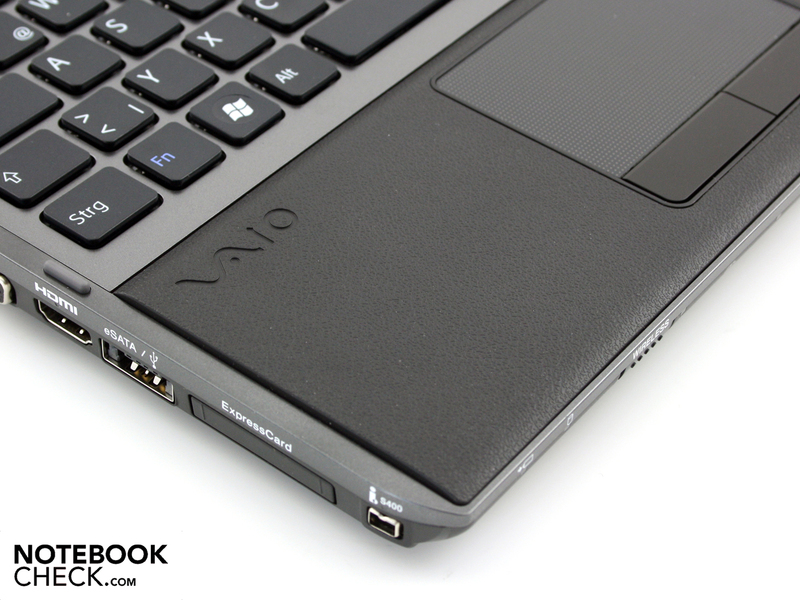 The two card readers are the only interfaces on the front side of the Vaio F11Z1E. Sony as expected integrates two reading devices to provide for the storage mediums Sony Memory Stick as well as HG-Duo, alongside the usual SD storage cards. This appears sensible since HG-Duo is the storage card format used by many single-lens reflex cameras, high-end digital cameras, and digital camcorders. It almost goes without saying that Sony provides WLAN Draft-N as well as an optical audio output (SPDIF). 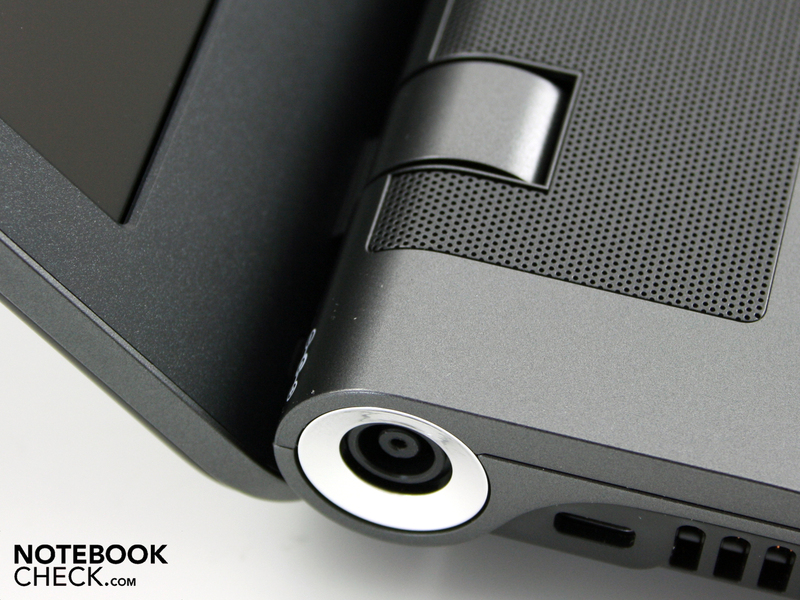 The latter is combined with the 3.5mm jack socket for the headphone output. 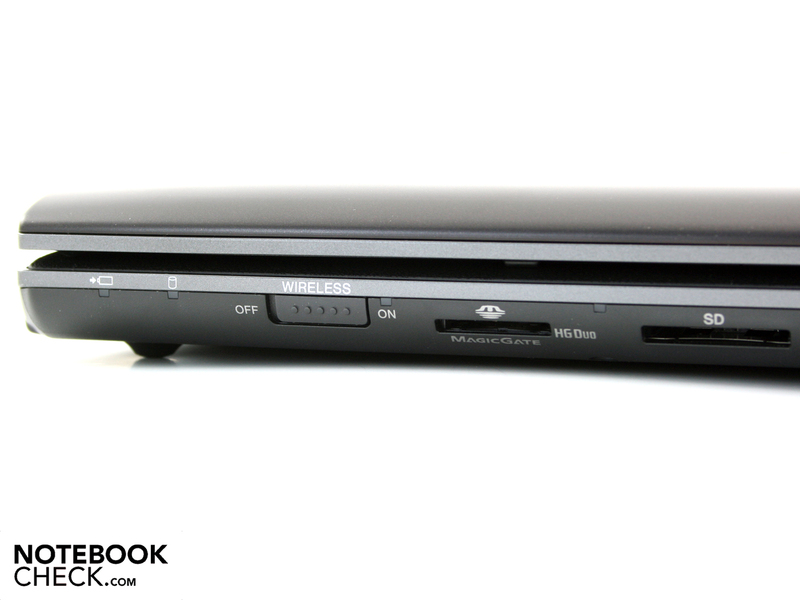 Mobile phones or other devices can communicate with the Vaio FW11 via Bluetooth. 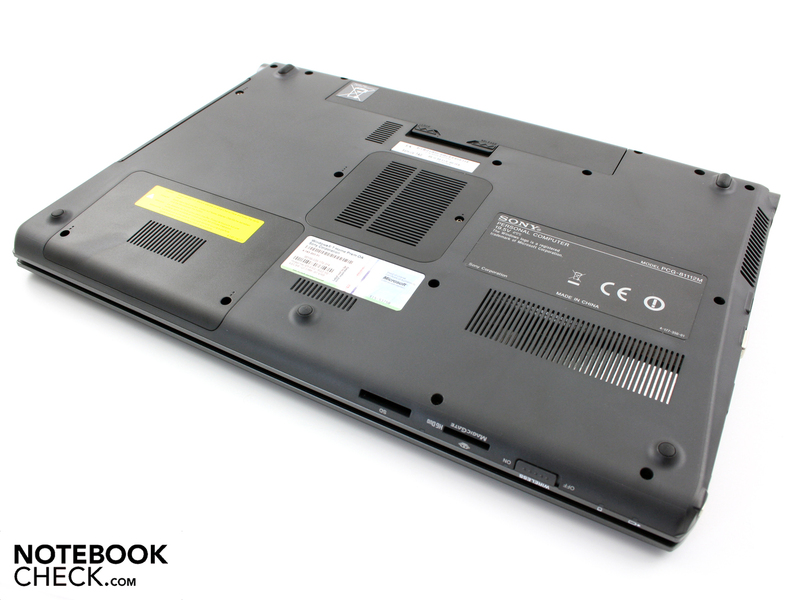 The BD RW BD-5730S6 is integrated as the optical drive, and provides the maximum in contemporary optical technology. 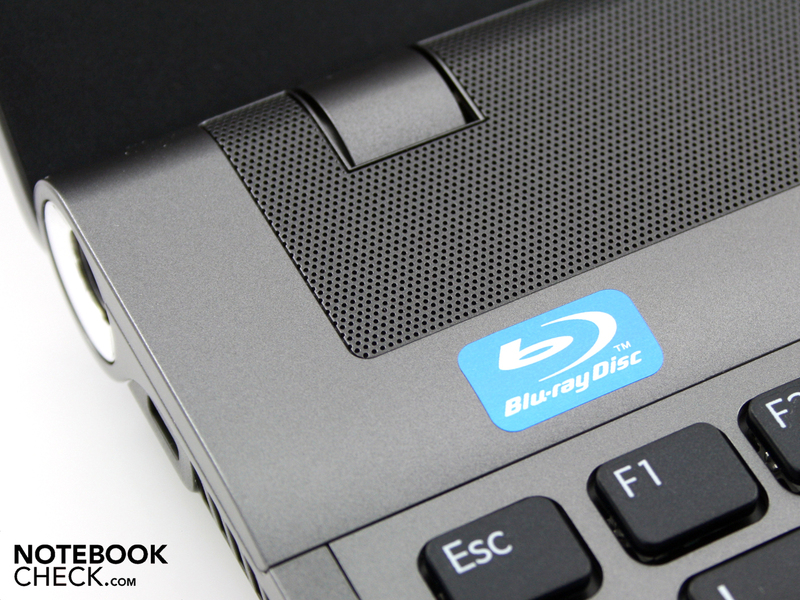 The drive cannot only read Blu-ray discs, but also write to them. Sony uses free standing keys, that are connected by a bridge. The distance between the keys is not as big as on desktop keyboards, but the keyboard area can nevertheless compete with external keyboards. The keys provide the writer a crisp and clear inflection point, a large key drop and a firm stop. These are, besides a generous layout, the most important criteria for many people who do a lot of writing. The bed of the keys sits firmly on almost the whole surface, with the only exception being the numeric keypad which gives way a little. The numeric keypad makes it easier to enter numbers or use the calculator. 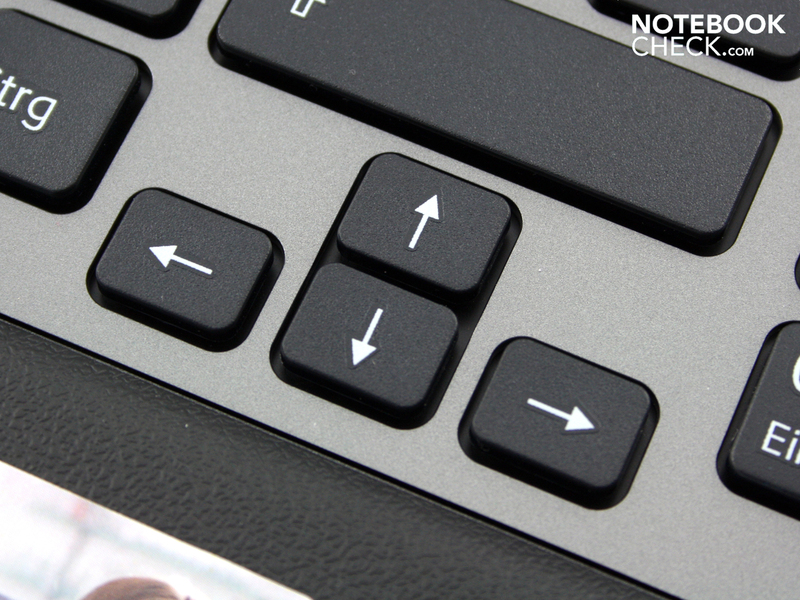 For games the clearly distanced arrow buttons are an advantage. The fingers can find these without looking so that the wrong keys are not pressed by accident. The mouse replacement is almost flush with the hand resting area. The slip resistant Alps-Pad is large and sensitive at the edges. The surface has scroll bars, even if these are not visually or haptically marked. 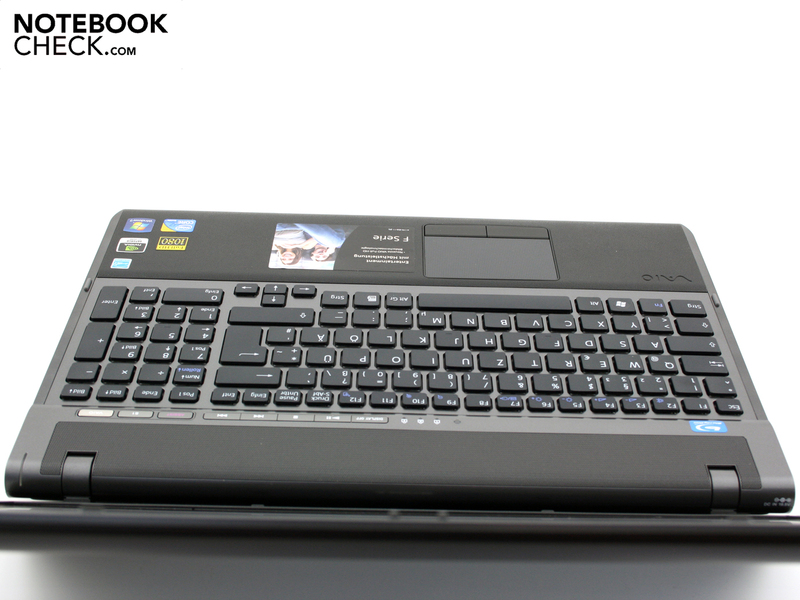 Users can use two finger gestures, and it is a multi-touch pad. 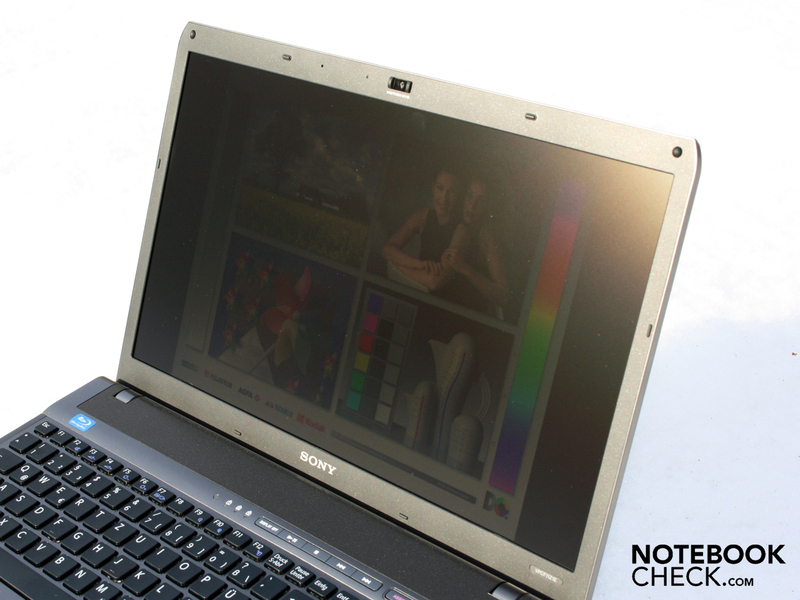 The 16.4 inch full HD display on the Vaio VPC-F11Z1E has a very high resolution with 1,920x1,080 pixels. The 60Hz panel (type not writable) uses an anti-reflective surface, so you don't have to worry about reflexions. 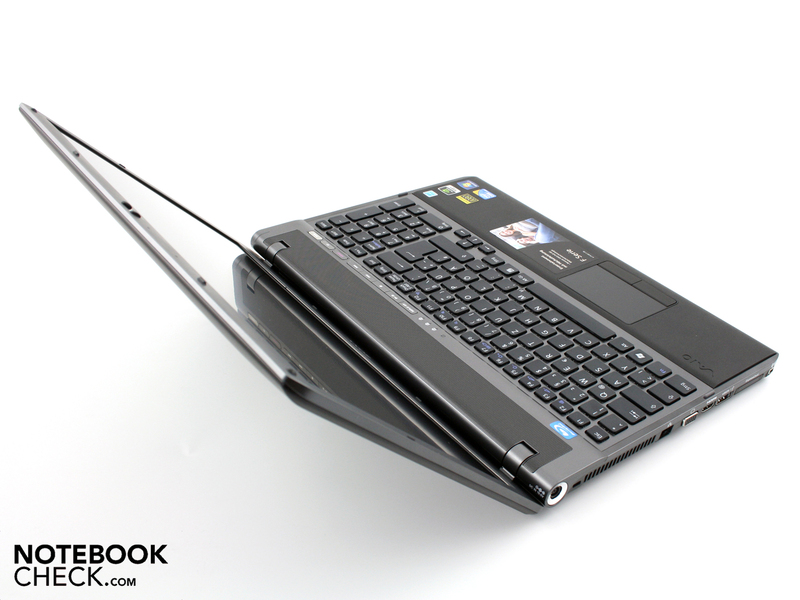 For the requirements of a multimedia and desktop notebook the display is ideally suitable. High contrast for the display of colors during movies, or for pictures or games is available. We measured a black level of 0.47 cd/m² at maximum brightness. This is a good contrast at 564:1. 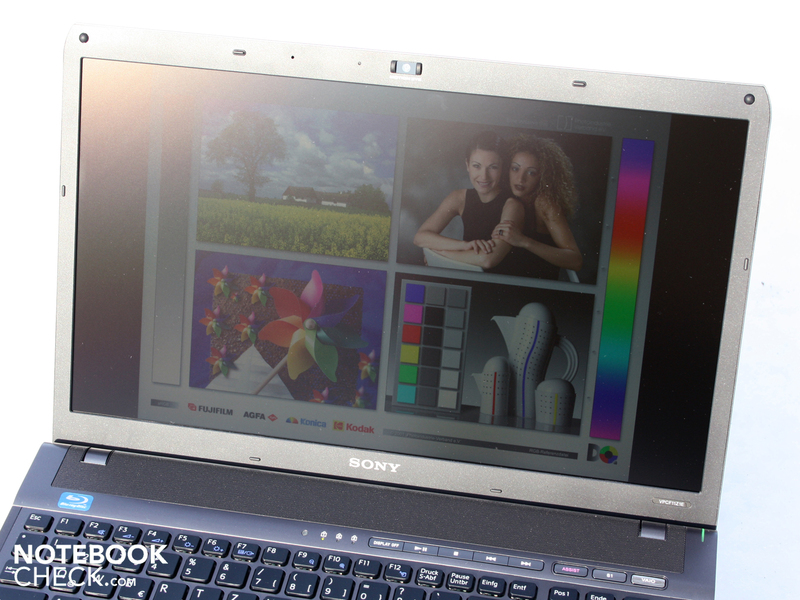 The color space shows that the Vaio F11Z1E achieves its aspirations. The ICC profile is not perfect (100% GAMUT is by no means available) but definitely respectable. A little disturbing is that movements of the lid immediately show light pressure points on the entire surface of the display. When used on a desk this effect is hardly noticeable, since the display is seldom moved. As soon as the TFT is standing still again, the pressure points disappear. 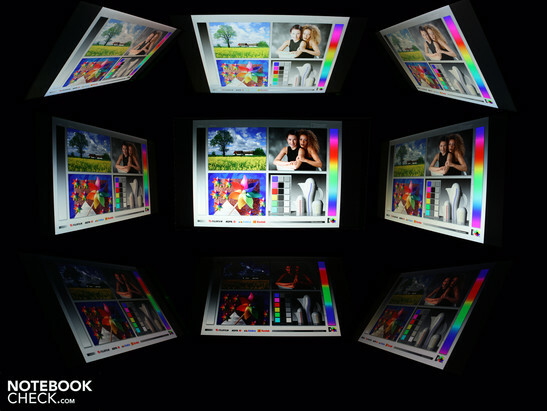 The LED backlight on the 16.4 inch display illuminates the display in the middle by up to 265 cd/m². For use indoors this is more than enough. In order to take these measurements the brightness sensor had to be deactivated. This dims the backlight according to the ambient light level. The highest level of which is only activated automatically under sunlight. 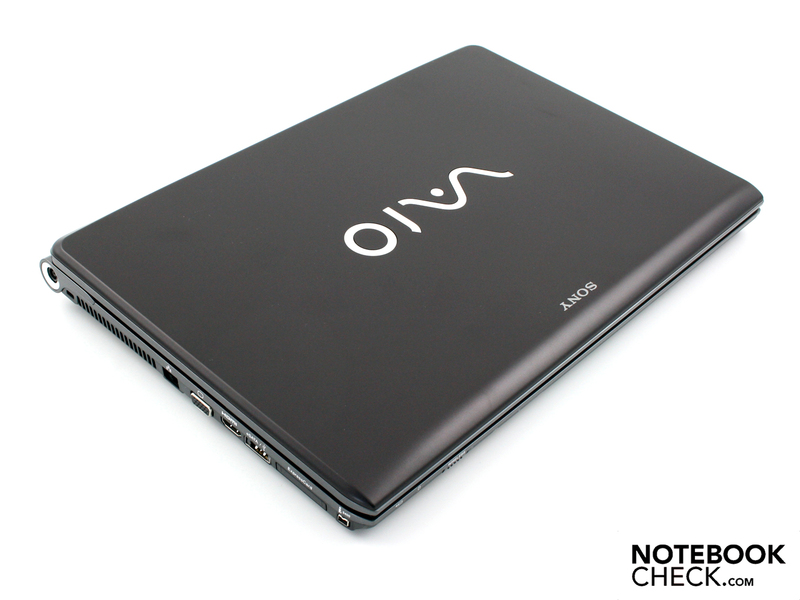 The Vaio F11 is not ideal for use outdoors due to its size and a weight at 3.65 kilos inclusive of the power adapter. But thanks to the anti-reflective TFT display with a high brightness averaging at 252 cd/m², it can also be used in the garden. Under direct sunlight however, the viewing angle is reduced and the colors no longer shine as brightly as usual. Everything else stays clearly recognizable and users can continue working with the laptop. A notebook needs good viewing angles so that viewers can recognize colors or writing from the sides and above with constant brightness. 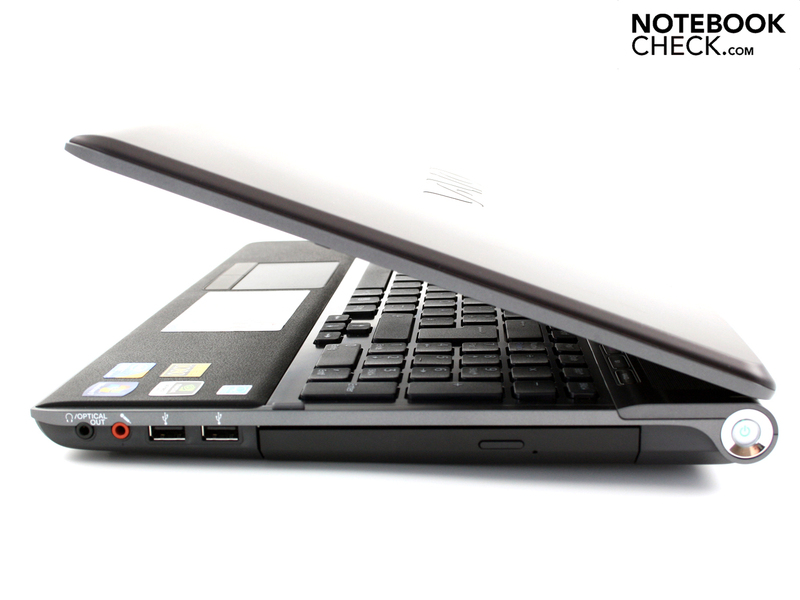 For a multimedia notebook with aspirations to be amongst the high-end class, good viewing angles are obligatory. The reason: For professional or private use there are often many pairs of eyes looking at the display. This also counts for movie sessions or computer games. The horizontal viewing angles are very good. There are hardly any discolorations, even when looking from an angle of 80 degrees. Vertically our eyes can deviate by up to 25 degrees, at which point the colors start to invert. This effect only sets in slowly though, so we can still recognize a picture at an angle of about 45 degrees. Users will have little to complain about when it comes to viewing angles. Perfectionists will be slightly disturbed by the lack of vertical stability. The color stability of a desktop TFT cannot be matched by the VPC-F11Z1E. Sony has fitted its Vaio F11Z1E with a Core i7-720QM. The 720QM has 1MB Level-2 cache and 6MB Level-3 cache. The TDP lies at 45 Watts. The Clarksfield 45nm CPU has four physical cores, each of which has a clock speed of 1.60 GHz. This sounds like little, but is merely to be understood as the base clock speed. The real clock speed when in operation lies between 1.60 and 2.80 GHz. The dynamic overclocking is made possible by the Intel Turbo-Boost. Whereby individual cores of the processor are automatically overclocked. The particular running applications determine how many cores should raise their clock speed. Thereby applications should always have the processing power available that are currently required. It should therefore no longer matter whether a program or game is multi-core capable with an Core i7 CPU. The Hyper-Threading function causes the four physical cores to be multiplied providing an additional four virtual cores. Applications can thus make use of up to eight cores. Depending on the TDP, power supply, and utilization of the cores, the clock speed of the individual cores automatically adapts itself, whereby the maximum clock speed can only be achieved by using a single core. If all the physical cores are used in parallel, then the maximum clock speed is accordingly less. A total of 8.192 MB DDR RAM stands side by side with the Core i7-720QM. This sits on two Samsung RAM modules. The 64 bit operating system Windows 7 Home Premium 64-bit can handle this large amount of RAM. Important for an performance orientated desktop replacement such as the Vaio F11Z1E is the interaction between the CPU, graphics card, RAM, and hard drive. This is assessed by PCMark Vantage. A total result of 5.844 points allows recognition of a potent system. Although the score is a little less than similarly configured systems with the same i7-720QM have to offer. An Asus G60J with a GeForce GTX 260M for example achieved 6.199 points. Altogether the difference of approximately 400 points is however marginal. Partially responsible for the good PCMark Vantage score is the 500 GB hard drive manufactured by Samsung. The 6.511 3DMarks of the GeForce GTX 260M only have little influence on the PCMark. Even an i7-720QM combination with a GeForce GTX 260M doesn't achieve significantly more points (Asus G60J). 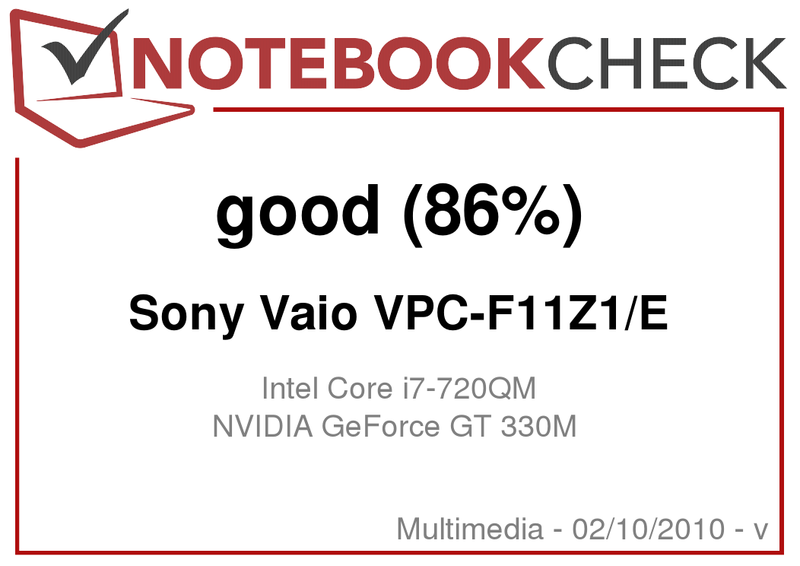 The i7-720QM CPU in the Vaio VPC-F11Z1E offers very good performance. The Turbo-Boost function provides a high performance for any application, regardless of whether or not multiple cores are used. The i7-720QM is faster than its predecessor Core 2 Duo in all multi-core benchmarks - inclusive of the extreme variants. Merely in the single-core benchmarks can a fully utilized Intel T9800 (2.93 GHz) outperform the 720QM (maximum 2.8 GHz). In the Cinebench R10 single test, the 720QM achieves 3.592 points, while the T9800 achieves slightly more with 3.633 points. We inspected the latencies with the DPC Latency Checker. If these are too high, it can lead to problems when connecting external devices (e.g. audio clicks with external sound cards, or short interruptions of real-time audio). The times for the Vaio F11Z1E are generally below 1.000 µs. Hence there don't appear to be any faulty drivers for internal devices (WLAN adapter, sound card, USB host controller). 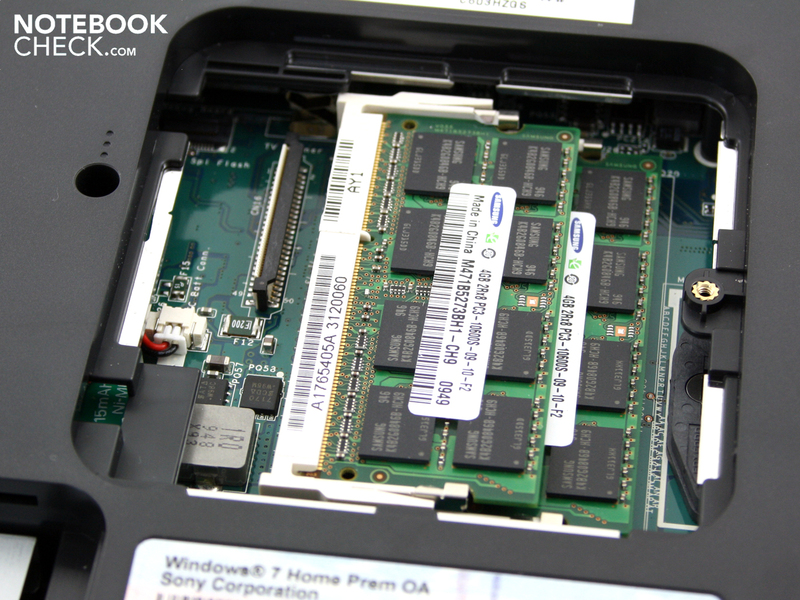 In the case of the Vaio VPC-F11Z1E, the processor stands side by side with a 5,400 rpm hard drive by Samsung. The 500 GByte HDD (HM500JI) quickly reads data from the rotating disks at 64.8 MByte/s in sequential read mode. 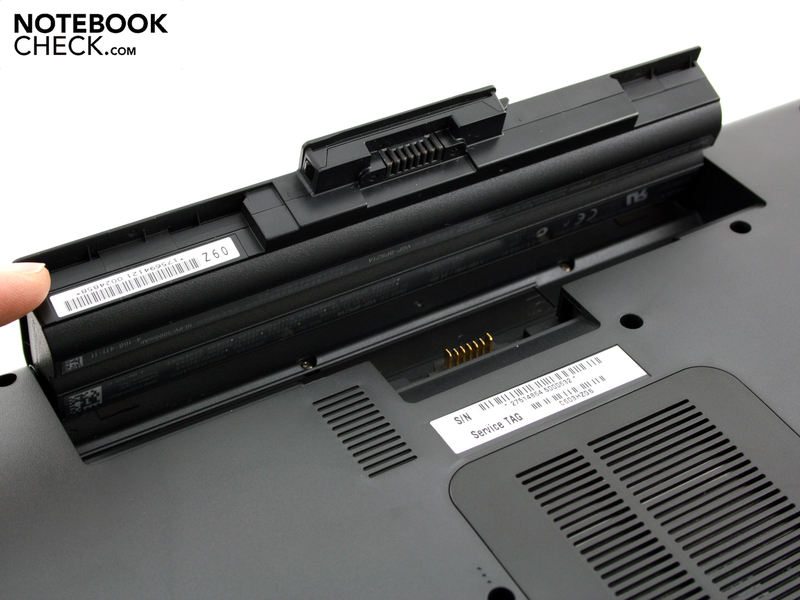 This helps the Vaio F11 to achieve a good system performance. The data transfer speed is a good average value, but by no means optimal compared to other contemporary 2.5 inch notebook hard drives with 5,400 rpm. Optimal values without RAID lie at about 75 MB/s. The HDD read- and write-heads cannot be heard during operation. For use as an editing studio for videos or animations, a second hard drive combination (RAID 0/1) would have been ideal. But the Vaio F11 simply doesn't have the necessary space for a second hard drive. The integrated GPU is an Nvidia GeForce GT 330M with 1.024 MB DDR3 RAM. The GPU core has a clock speed of 575 MHz, while the RAM has a clock speed of 790 MHz. The name indicates middle-class graphics, something which game tests and benchmarks confirm. The graphics card benchmark 3DMark2006 achieves a score of 6.511 points. This is almost identical to the result of the Samsung R580 Hawk with the same GPU, but a Core i5-520M CPU. The R580 achieved 6.412 3DMarks. With this the GT 330M is on a level with several Mobility Radeon HD 4650 systems that contain the old CPU generation Core 2 Duo. A GeForce GT 240M, which we have only had for testing in combination with weak Core 2 Duo processors (T6600, P7350), however leaves the GT 330M behind. The 3DMark2006 is a good milestone, but does it show us the real gaming power of the i7-720QM + GT-330M combination? Gaming fans will doubt this. That's why we performed several gaming tests. A game that requires several CPU cores for best performance. The i-720QM test system reached frame rates for which a strong GPU such as the GeForce 8800M GTS or the GeForce 9700M GTS would previously have been required. WiC is playable at 31 FPS at a resolution of 1.024 x 768 pixels, and the detail level set to high. For those that are satisfied with lower levels of detail, the resolution can be increased to approximately 1,366 x 768 pixels. 60 FPS at 1,024 x 768 leaves a little room for increasing the resolution. A test device equipped with an i5-520M and GT 330M (Samsung R580) only achieved about 2-3 frames less in the World of Conflict benchmark. The shoot'em up doesn't profit from the four, or more specifically eight cores, but from the Turbo-Boost. When set to 1,024 x 768 with the detail level set to high, the game runs smoothly at 79 fps. This allows a lot of headroom, and a resolution of 1,920 x 1,080 pixels is therefore just as playable with the detail level set to high (4xAA). 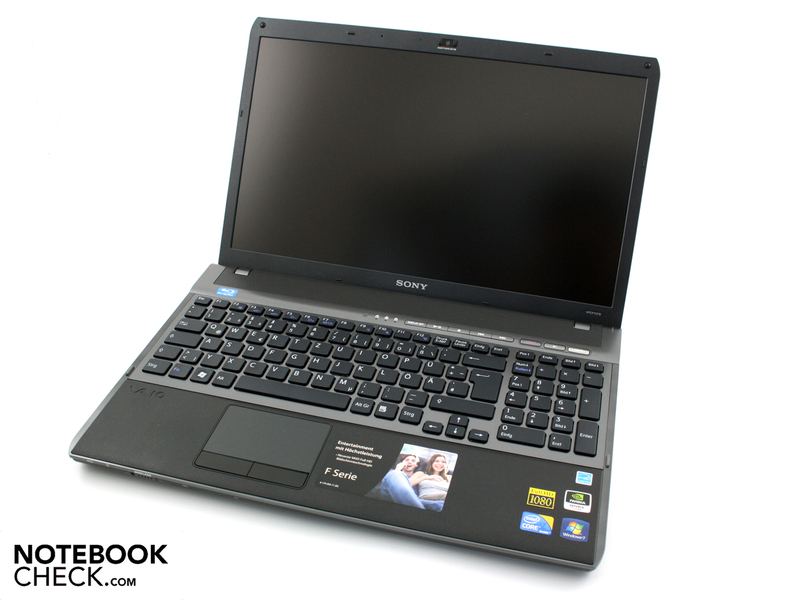 Sony's 16.4 inch notebook thus provides the option for playing less demanding games in full HD. As we will see later, this is however not the case with all the tested games. The popular shoot'em up runs smoothly at 35 fps, with the resolution set to 1,024 x 768 and high detail. Gamers don't have any headroom to change to the native HD-Ready-Resolution. FarCry2 doesn't make much of the strong multi-core processor, and would rather have a more powerful graphics card. Even an MSI GT627 with a comparatively weak Core 2 Duo P8600, but strong GeForce 9800M GS, offers significantly more at 49 fps using the same settings. Crysis is no longer smoothly playable at 27 FPS with a resolution of 1.024 x 768 and high detail level. The shoot'em up doesn't seem to benefit from the Hyper-Threading of the Core i7. Even a T6400 (2.2 GHz), as in the Samsung R522, is enough to achieve 28 fps with a slightly more powerful Mobility Radeon HD4650. In the Crysis GPU benchmark, the Vaio VPC-F11Z1E therefore lies on the level of a GeForce GT 240M (1,024 x 768, details: high). Crysis only becomes playable with medium detail at the same resolution achieving 40 fps. The fantasy adventure Risen offers excellent graphics, is however very demanding. Using medium settings (1,024 x 768, medium, 2xAF) the Vaio VPC-F11Z1E only achieves 26 fps. In the native HD-Ready-Resolution with high detail (4xAF) Risen is no longer playable on the Vaio F11Z1E, providing a mere 12 fps. Risen doesn't achieve any advantages from the multi-core processor, or the Turbo-Boost. The strategy game requires a strong graphics card for a decent resolution (1,280 x 1,024) and high details (very high). This is not the case with the GT 330M. We measured 21 fps. The picture obviously stutters when scrolling and zooming. The frame rate is identical to the Core i5-520M + GT 330M system Samsung R580, with low settings (1,024 x 768, low detail). The GT 330M easily handles Fear 2. The horror-shoot'em up can be played with a high resolution (1.280 x 1.024) and high detail (High, 4xAA). We measured 29 fps. Gamers at best have the chance to play at full HD resolution when setting details to low. The cooling vent makes a lot of noise. 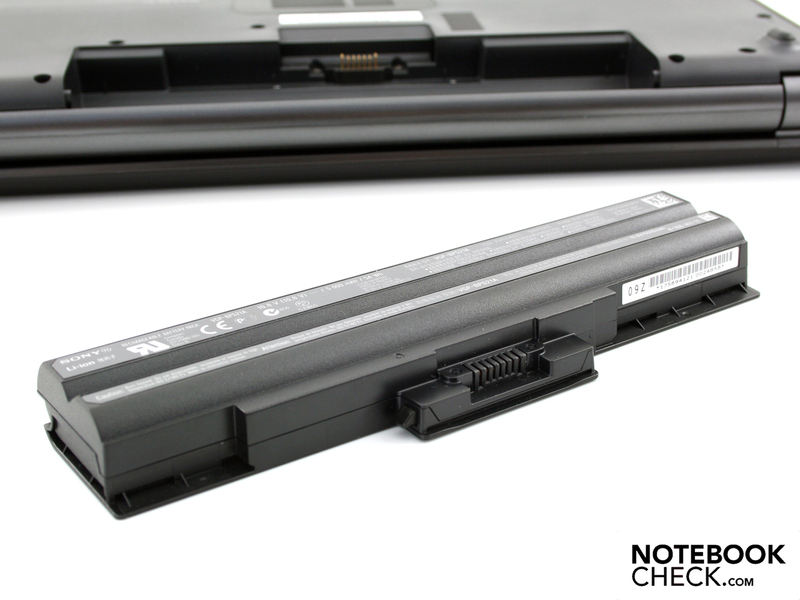 The system noise is the only, but also the biggest weak spot of the Vaio VPC-F11Z1E. 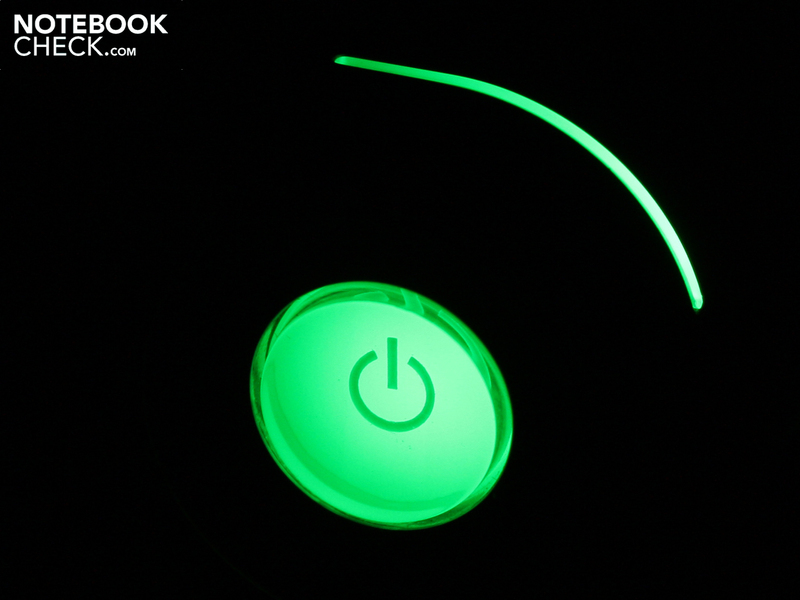 With a high performance Core i7 processor, we don't expect a whisperingly quiet system noise. This 16 inch notebook is not only loud though. The cooling fan changes its speed arbitrarily, even in idle mode, and gives a high pitched fine droning sound from itself at medium speed. This mechanical vibrating is not measurable as noise, but nevertheless noticeable and disturbing. The idle mode operation, with the energy saving mode active, stays relatively constant in terms of noise. We measured 30.7 to 31.3 dB(A). As soon as the F11Z1E has to do any calculations though, the cooling system turns up to about 37.6 dB(A). It doesn't stay constant however, and instead fluctuates between 37 and just under 40 dB(A). Until now we haven't submitted the F11Z1E to constant load though. During our game benchmarks the system noise increased up to 46.6 dB(A). This applies for particularly graphics intensive games. Pure CPU benchmarks bring the system noise to a maximum of 44.7 dB(A). But only a stresstest (GPU + CPU) over several hours let us squeeze the last of noise out of the cooling system: 48.1 dB(A). For all levels of load and their respective system noise, there is an uneasy increasing and decreasing of cooling fan speed. 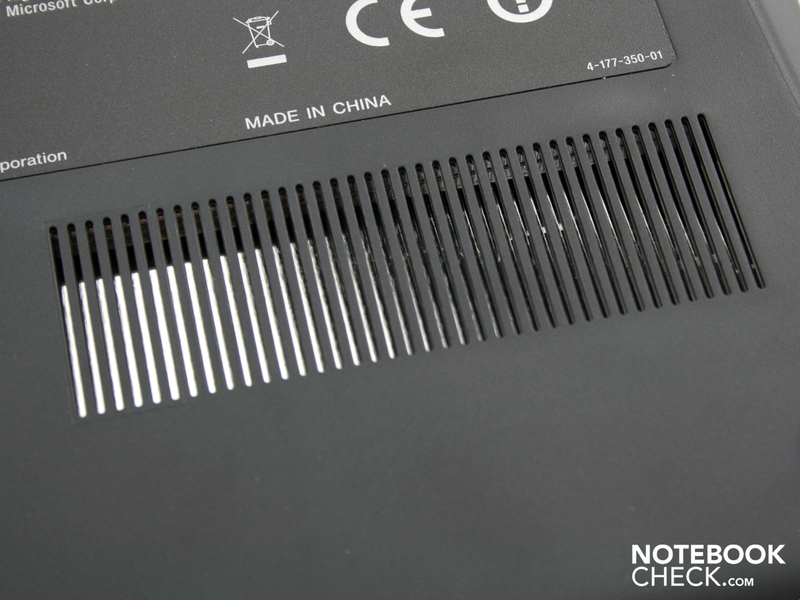 The heat emitted from the top of the case can luckily be classified as of no concern, thanks to the tireless work of the cooling fan. After the stresstest for the processor and the graphics card, we measured no more than 38.6 degrees Celsius on the hand resting area. 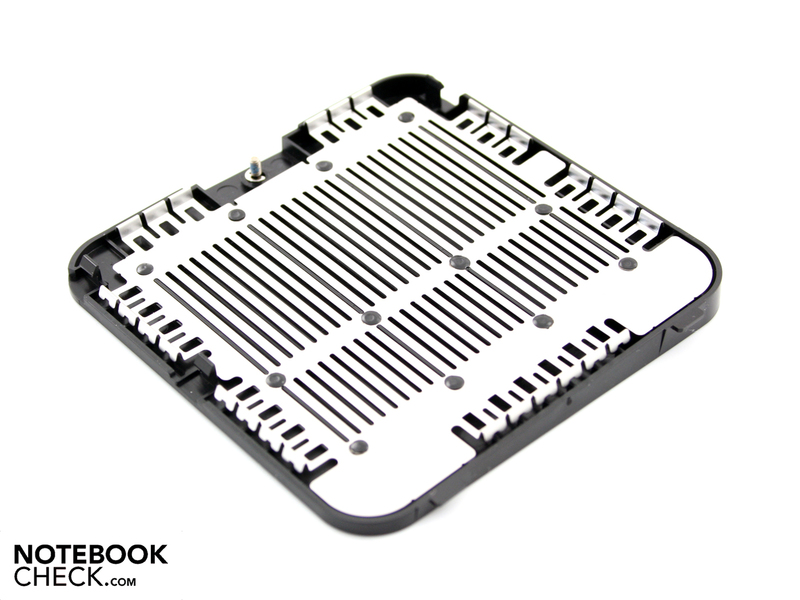 The base plate can exhibit higher temperatures. Following a high load, we measured 44.9 degrees Celsius around the heat pipe. This high but still acceptable surface temperature however only applies to certain areas. Most areas of the base plate rank between 23 and 30 degrees. Operational use while located on your lap is however not recommended, because the cooling vent inlet is then covered. 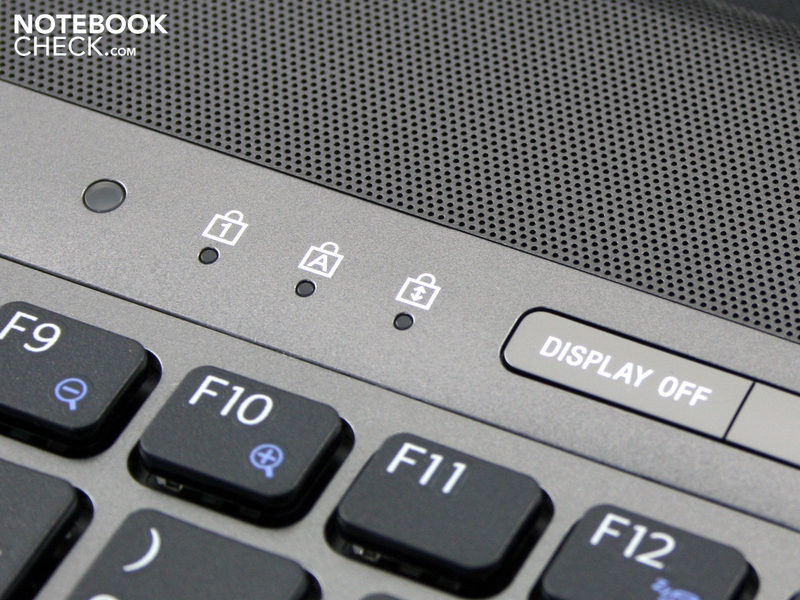 During a realistic idle scenario, the Vaio VPC-F11Z1E stays cool. The previously warmest point on the base plate is now only at a temperature of 31.7 degrees. The Vaio F11Z1E survived the 12 hour stresstest without problems. The processor did not exceed the core temperature of 82 degrees Celsius. The GPU did not exceed 75 degrees. The stresstest did not have any effect on the performance of the components (thermal throttling). A subsequently performed 3DMark06 test achieved the same 3DMarks as the test under normal conditions: 6.480 3DMarks (CPU 2.955). (±) The average temperature for the upper side under maximal load is 33.8 °C / 93 F, compared to the average of 30.9 °C / 88 F for the devices in the class Multimedia. (+) The maximum temperature on the upper side is 38.6 °C / 101 F, compared to the average of 36.5 °C / 98 F, ranging from 21.1 to 71 °C for the class Multimedia. (-) The average temperature of the palmrest area of similar devices was 29.1 °C / 84.4 F (-9.5 °C / -17.1 F). The stereo speakers are located above the keyboard. 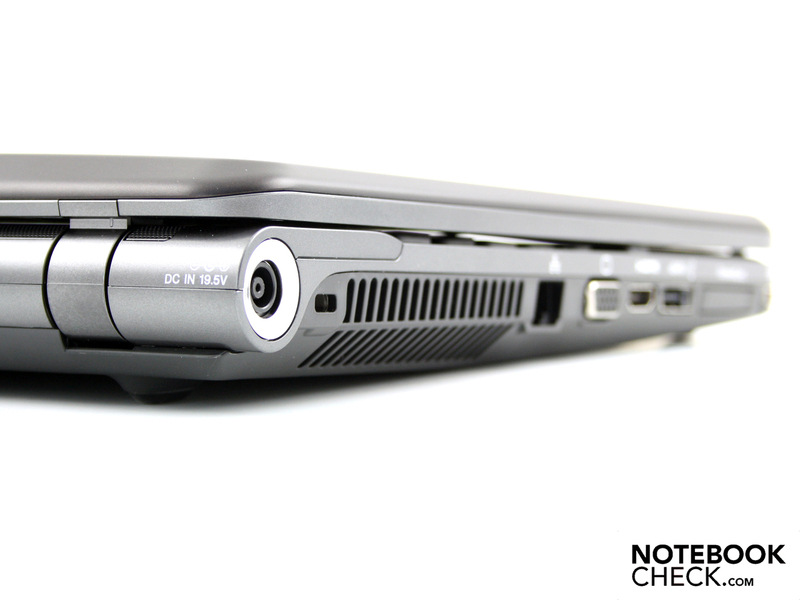 The acoustic expectations from a high-end multimedia notebook are not satisfied by the Vaio VPC-F11Z1E. There is no subwoofer and the sound is concentrated in the mid-range. At high volumes the sound is slightly distorted. The Dolby audio-enhancer, the only option for sound improvement, should be left enabled. If it is disabled there are inappropriate high frequencies in the sound. For those who want to connect an external sound system, it is possible to use the 3.5mm audio jack output (headphones). Or alternatively the optical SPDIF output, which is concealed in the same socket. Headphones and SPDIF are thus combined. The output signal level is unexpectedly low, but noise free. 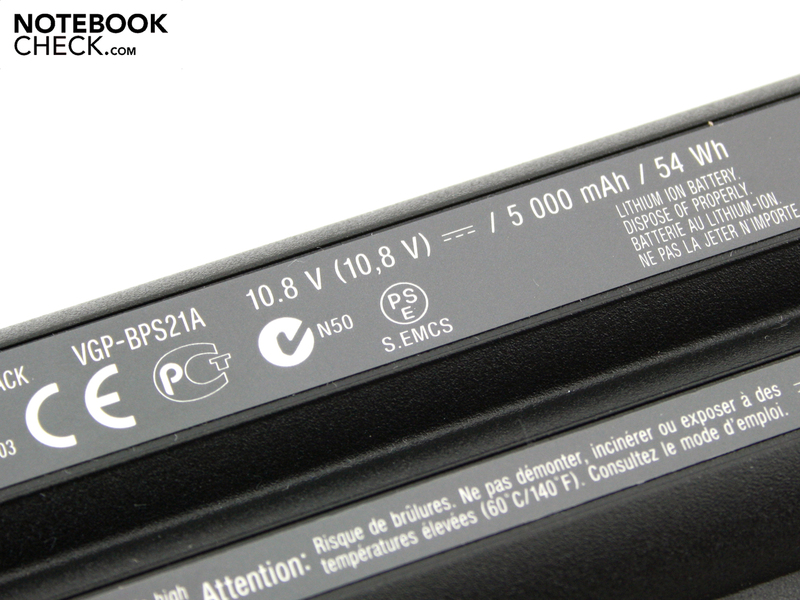 This 16.4 inch notebook is equipped with a 54 Wh battery (5.000 mAh). Its a capacity that would keep a netbook going for a long time, but is not much use to the high performance Vaio F11, since it already needs 17.9 Watts when idle. The battery life is typical of Core i7 notebooks. 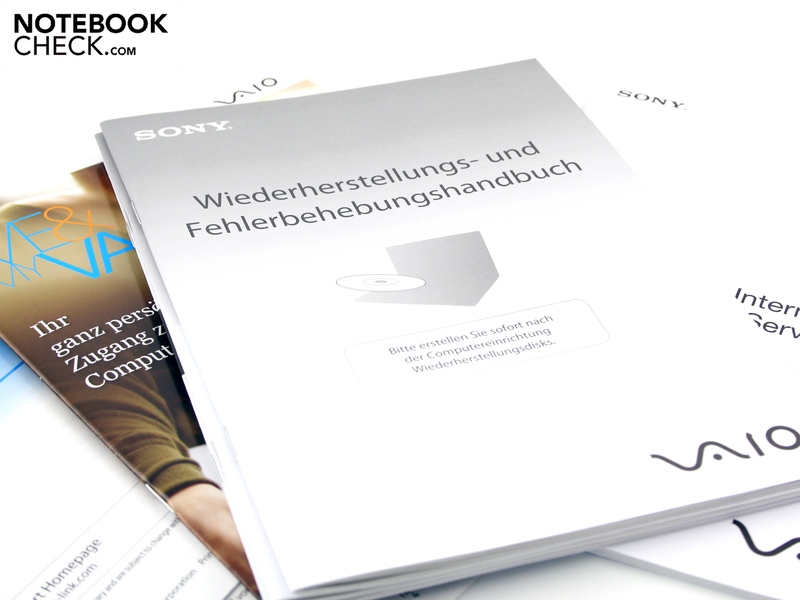 The mobility of the Vaio VPC-F11Z1E lies at 1:31 hours (91 minutes) for a WLAN surf session. During this time we visited a few news portals and downloaded a couple of files. For those that are economical and merely edit documents, the battery life can last up to three and a half hours, with WLAN and Bluetooth disabled. The maximum, but unrealistic battery life that we determined from the BatteryEater Reader-Test, came to 214 minutes (3:34 hours). For this test the brightness of the display was set to the minimum. How long can users watch a DVD movie? The test determined a low 97 minutes. The brightness was set to medium during these 1:31 hours, and the wireless modules were deactivated. 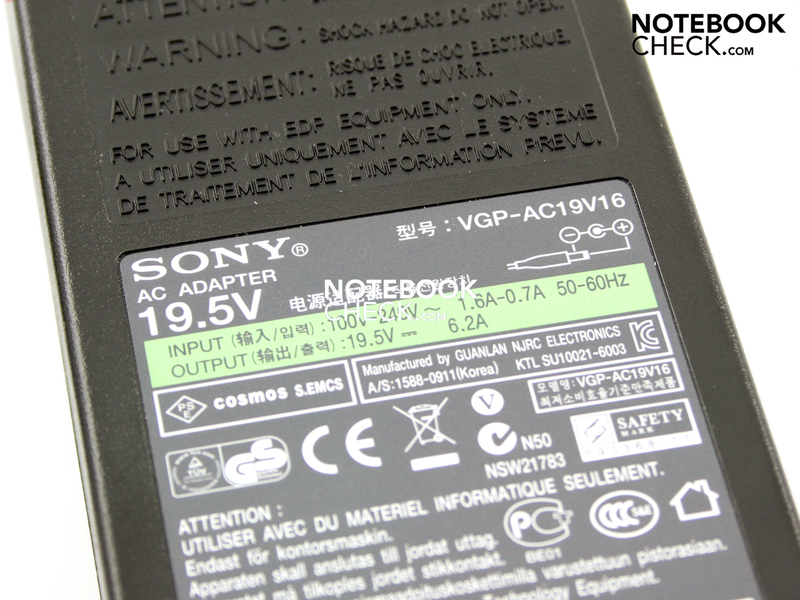 The short battery life leads to the presumption that the various levels of load have a high power requirement. The measurements with the multimeter confirm this. 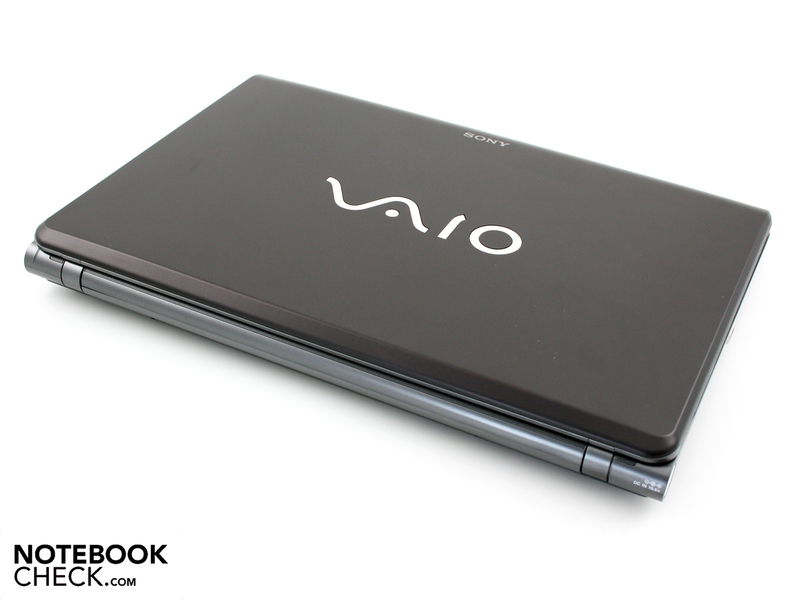 The minimal requirement of the Vaio F11Z1E is 17.9 Watts (idle, maximum energy saving). A working-idle scenario with active WLAN and highest brightness lies at 32.5 Watts. When the Intel Core i7-720QM and the Geforce GT 330M are operating at maximum capacity the effective power lies at 116 Watts. A power consumption this high cannot however even be reached with 3D games. We determined this effective power during the stresstest with Prime95 and Furmark. 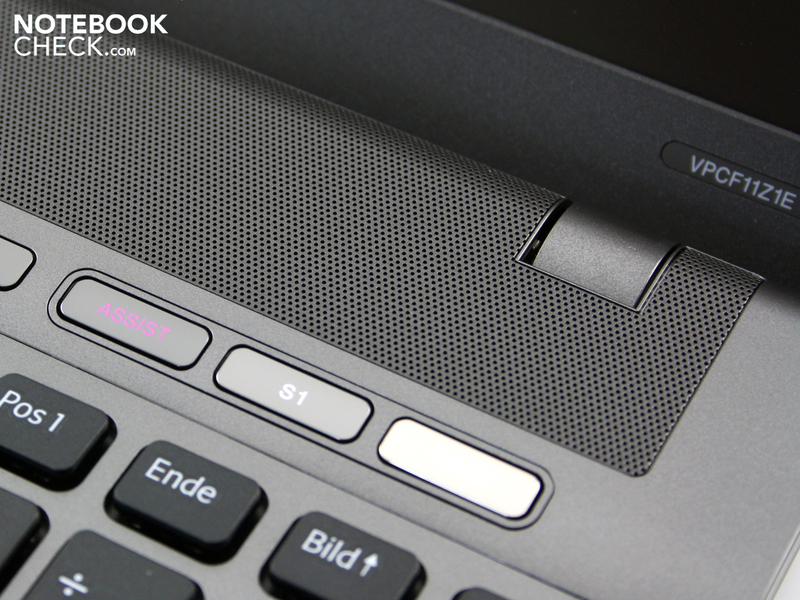 During a test with 3DMark06 the power consumption of the Vaio notebook lies at 88.1 Watts. The 120 Watt power adapter has a capacity appropriate for the maximum possible power requirement. Sony's Vaio F11 in the VPC-F11Z1E/BI variation is a potent 16.4 inch notebook with a powerful Intel Core i7 four core-CPU. 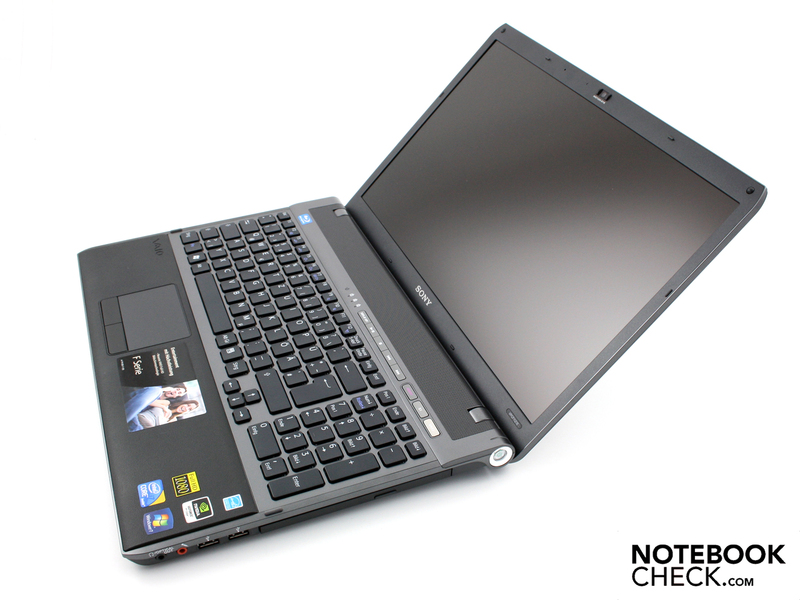 The combination with a middle class GPU, such as the Nvidia GeForce GT 330M, doesn't allow this laptop to be a gaming bolide; but definitely a well performing work notebook for professionals and multimedia enthusiasts. There's not much left to wish for when it comes to the interfaces, thanks to the HDMI, eSATA, SPDIF, and FireWire connections. There is more than enough storage capacity on the 500 GB hard drive, and ample RAM with 8.192 MB, which 64-bit Windows 7 can handle. The current price of approximately 1.450 Euros wouldn't be justified, had Sony not included a Blu-ray writer, as well as a high contrast full HD display. This provides professionals with an acceptable color space, and a stable horizontal viewing angle. Not so typical for Sony Vaio, but happily greeted by professional users, is the bright 16.4 inch non-reflecting display. The cooling system is effective; the temperatures on the surfaces stay low, even after hours of high load. Unfortunately this doesn't apply to the system noise. This is not only loud when idle or when running at half or maximum capacity, but also annoying due to an irregular frequency. The Vaio F11, which is also available in smaller versions (no Blu-ray writer, less RAM, Core i5), is ideal for ambitious notebook users that want to work seriously with a half portable notebook. If Sony gets the irregular cooling fan repaired, the only real flaw of the Vaio F11 will be removed. The Vaio VPC-F11M1E/H with a Core i5-520M for example, is available with the same display for 970 Euros (current online price). The GeForce GT 330M graphics stay the same in all the F11 variants. Components such as RAM or Blu-ray are variable. 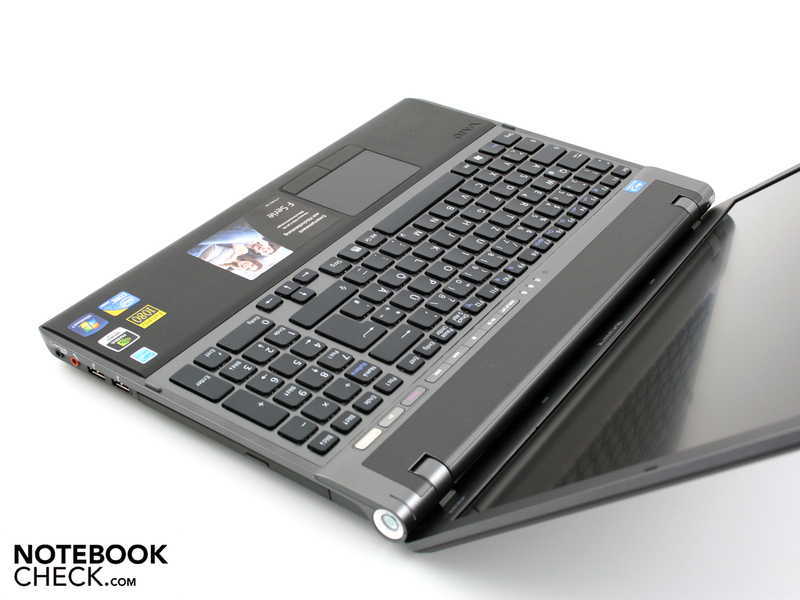 The Vaio VPC-F11Z1E/BI is a high performance 16.4 inch notebook. 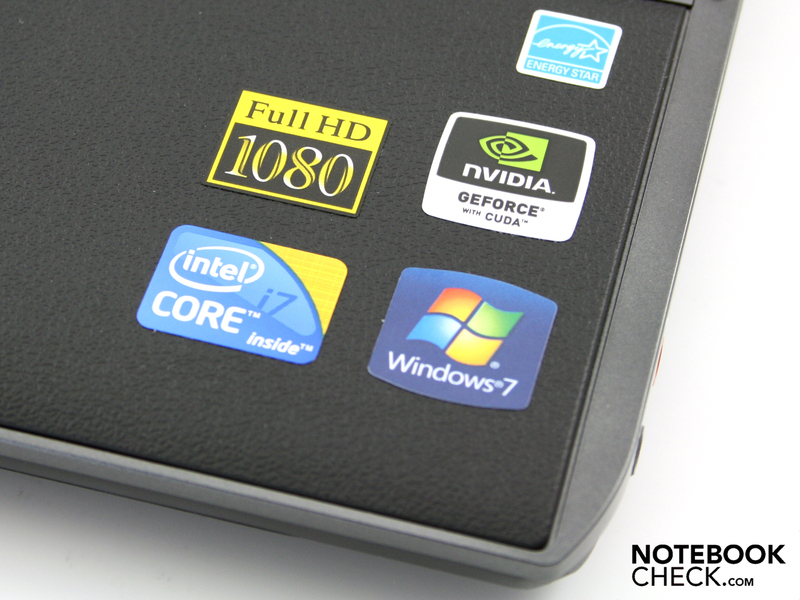 We tested the premium variant with 2 x 4.096 MB, Blu-ray writer, and Core i7-720QM. On the left there are LAN, VGA, HDMI, eSATA, ExpressCard34, and FireWire. On the front HG-Duo and SD storage cards can be inserted. although the battery life of the 5.000 mAh battery is limited. 3:34 hours is the maximum battery life. since there are no feet on the bottom of the battery. The base plate is also worth a look. for another the user will find a panel for changing the RAM. The panel for the RAM compartment has a shield made of silver metal. The second panel in the base plate hides the 500 GB hard drive. This can easily be changed if required. Due to the compartment size the HDD panel is reinforced. 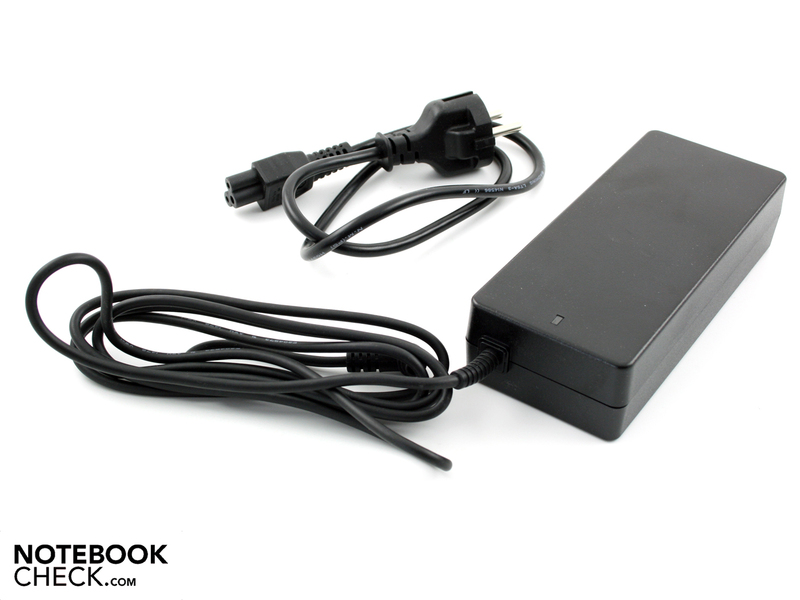 The power adapter weighs half a kilo and provides 120 Watts. At a maximum power consumption of 120 Watts this power is also necessary. A webcam with a resolution in VGA quality (640 x 480 pixels). The matte high contrast full HD display (1.920 x 1.080) undoubtedly has scarcity value. But also the large working area including the numeric keypad, and rubber hand resting area have no need to hide. The keys with their isolation-look offer a very good feedback when writing and provide a generous layout. The lid of the 16.4 inch notebook is completely matte black. No finger prints will be left behind here. The display hinges, lid, and chassis, make a solid and durable impression. In our eyes the Sony Vaio VPC-F11Z1E/BI is much more than a work notebook for content editing pros, but also as an entertainer for movies, music and games. 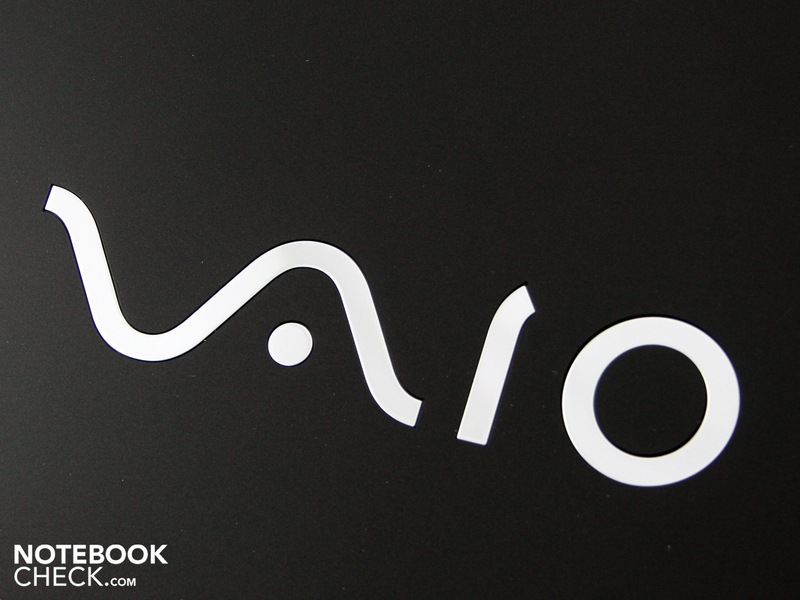 The hand resting area has a Vaio logo on it. The surface is made of hard rubber. The right side gives away parts of the configuration. 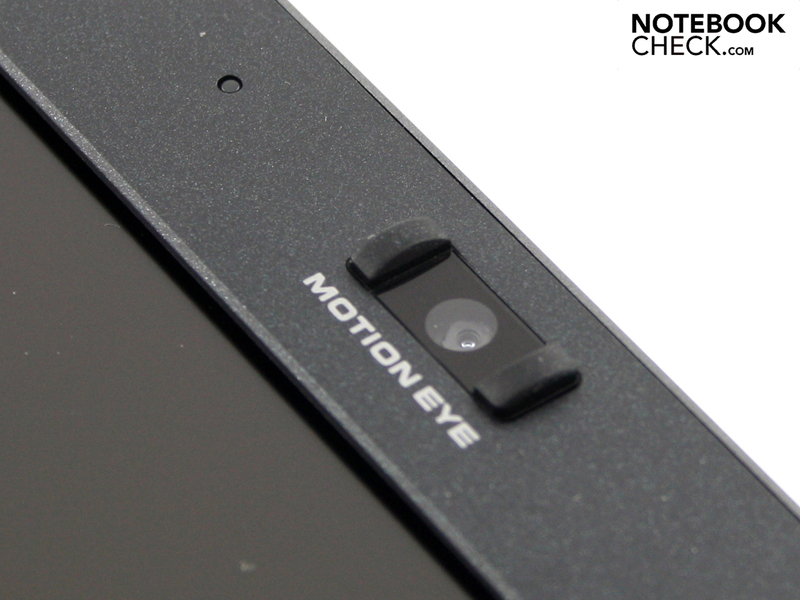 A sticker tells us that the full HD TFT display is best for watching movies. 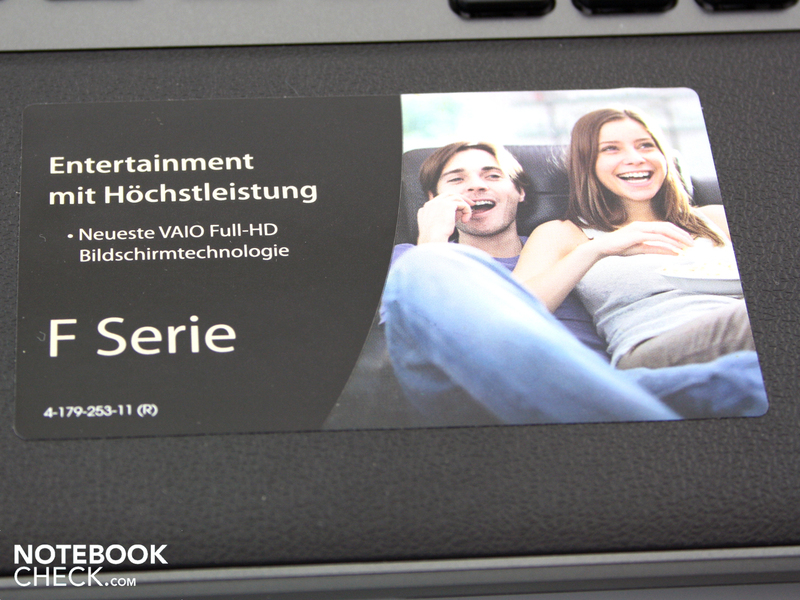 The special buttons for recovery/troubleshooting, program launch, or Vaio Media Gallery. The light sensor controls the backlight of the TFT display. It can be disabled via the Vaio-settings. The stereo loudspeakers are located above the keyboard under this perforated metal plate. The hinges hold the massive lid securely in position. On the right side the power-on button is illuminated when operational. The surface of the hand resting area is modeled on leather. Hands feel comfortable on the dull material. Storage mediums are not included in the accessories provided by Sony. The Recovery-Partition on the HDD can be secured on a DVD by a user (create recover disk). Perfect performance, combined with a great HD display, and a high quality case. A decent, constant speed cooling system. This would have made the Vaio VPC-F11Z1E the ideal desktop replacement. How does such an annoying cooling system not get noticed by such a manufacturer? The Asus G60J offers better graphics but a worse display. 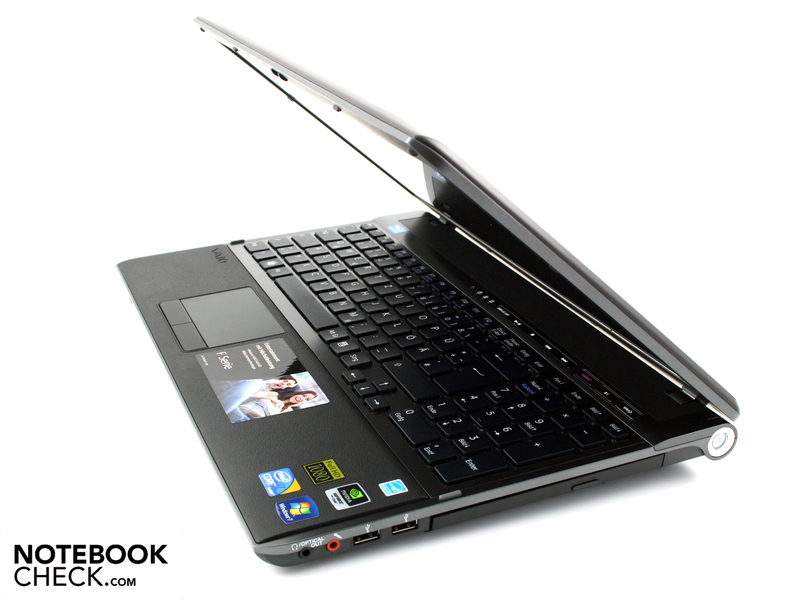 The Asus M60J is available in a very similar configuration for about 1.100 Euros, the Asus X62J for under 1.000. In both cases however, the display only provides an HD-Ready resolution.